Our current favorite for recordings -- the Black Panther Hammered Phosphor Bronze Snare. I have been partial to wood snares for a very long time, but right now, I seem to be having a love affair with my metal snares. Our newest snare doesn't have a picture yet -- It's a Worldmax Hammered Hawg 14"x6.5" Hammered Brass Snare. Got this photo from the web. I had some others custom built for me by Tito Marquez (including the 13x8 fibreglass snare mentioned above) -- a 10x5, an 8" and a 6" snare, all made of fibreglass, and a tambourine on which he installed snare wires too. ...Haaaay naku. Sana balang araw magamit ni Rickson ito lahat nang sabay sabay... then again, I only have 3 snare stands. I call this my Old Faithful. This is my 5.5"x14" Tama Starclassic Maple snare drum in Gold Sunburst finish. 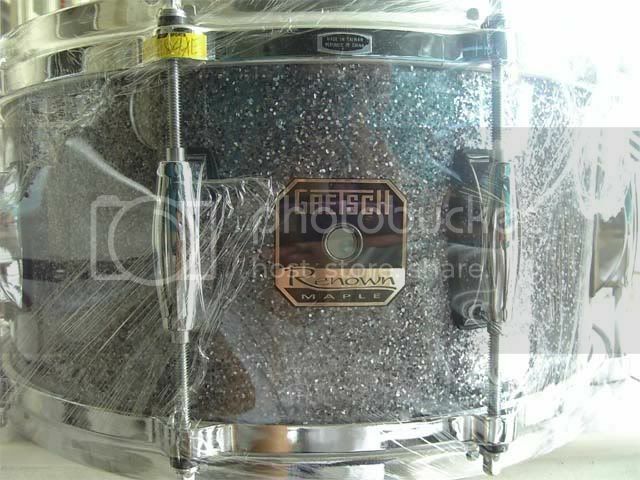 I bought this in Kuala Lumpur on early 2003, and this is the first high-end snare drum that I've ever owned. This is a first-generation Starclassic model, so it still has the 8-lug configuration (newer models already have 10) and the original-design snare throw-off mechanism. This is a very versatile snare drum which has a warm tone (a maple character), a good amount of crack, and exceptional cross-stick and rimshot sounds (thanks to its die-cast hoops). This drum also got quite valuable because its shell interior has the signatures of four great drummers - Simon Phillips (signed on October '05), Dom Famularo (signed on July '06), Kenny Aronoff (signed on October '06), and Pat Torpey (signed on April '07). This drum means a lot to me. Next is my Magic Drum. This is my 5"x13" Tama Artwood Maple snare drum, in Natural Maple finish. This is my current workhorse, and it's pretty much a mainstay on my band K24/7's gigs. This drum has so much attitude, and it works very well on R&B, hip-hop and groovy styles of music. Though I bet this can also work on most situations which require a cracking, cutting, power piccolo sound. I call it my Magic Drum because it never fails to amaze its listeners. It gets so much praise and compliments from bandmates, fellow drummers, and colleagues. This is the drum that everybody wants to steal from me haha! And here's the Popcorn. This is my 6"x10" PDP 805 snare drum in orange finish with black hardware. Eversince I joined K24/7 and began playing groovy music on a regular basis, I always thought of acquiring a small side snare which can simulate snare backbeats from electronic drum beats & can give me an alternative sound. Lyric's timing was just perfect, because they shipped in these side snares. And the great thing is, these 805 drums are not so expensive. The "popcorn" pop and crack is there, and with the snares turned off, it can double as a timbale-sounding drum. This little drum is a pocket rocket. For my reviews of my Tama Artwood Maple and PDP 805 snare drums, click on these links. 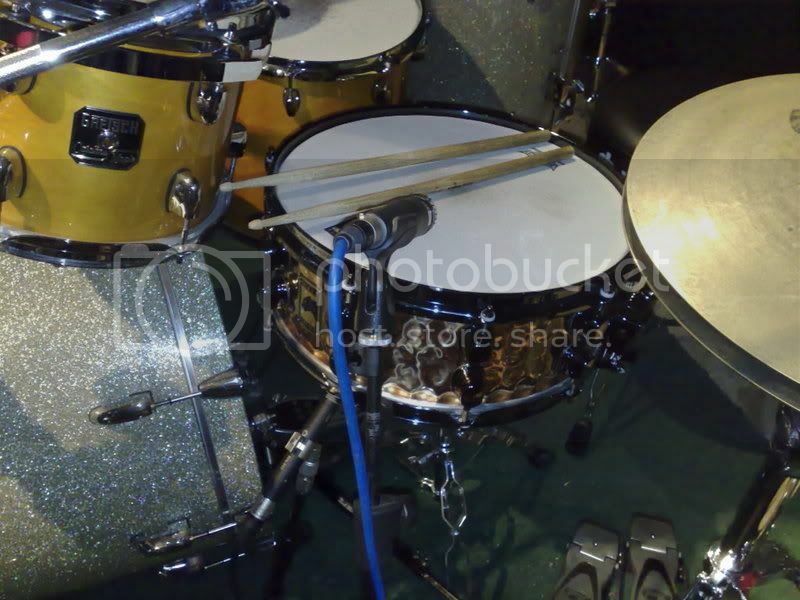 For more drum-related pics, feel free to visit my Multiply blogsite's photo albums. You can check out my Snare Drum Wish List photo album there, so that you'll know what I want for Christmas haha! I believe that with the Warlord snare drums, we pay more for its cosmetics (Swarovski crystals embedded on the lugs and emblems), special finishes, and potential collectible value. Well, these past years I've been working like there's no tomorrow... haha. I actually started with the fibreglass drums by Tito Marquez, because they're pretty good and pretty affordable too. My studio indeed is my biggest obsession, and hence, it takes a big part of my earnings (and lately, it's been rewarding me with additional earnings too. ) I guess I've been wanting to have a snare collection (considering that I'm not a drummer) so much that I actually fooled myself into thinking that I need them. I've been meaning to come up with my own collection of drum and cymbal samples, and drum programming has been an obsession of mine for a very long time. Plus, with a drummer like the very talented Rickson Ruiz, I really don't think any of my drum-related purchases are going to waste. As for the Warlord series drums, I think they're more of an eye candy, although I almost wanted to start learning how to play drums when I saw the drumset in Canada, and then at Guitar Center in Hollywood. great snares sir Drumster, I remember you brought your magic snare at a mini EB, I was lucky enough to see and hear it... talagang magic... can't believe that the sound is coming from that snare...... nasa studio pa naman kmi nun, confined yung space kaya talagang ma appreciate mo yung sound... hehehe count me in to those who want to steal that snare!!! Thanks for appreciating, bro! Nobody can steal the Magic Drum from me hehehe! Thanks bro Dindin! Yup, I really take good care of my stuff, and I like them clean and shiny. My snares also have a few of those small battle scars, no thanks to clip-on mic holders hehe! Pero buti na lang hindi halata kasi maliliit lang & thankfully hindi naman na-damage yung mga finishes. Hmm... Some of your nice Zildjian cymbals for my Starclassic?? Hahaha joke lang bro! Hindi ko mabibitawan itong Starclassic ko. 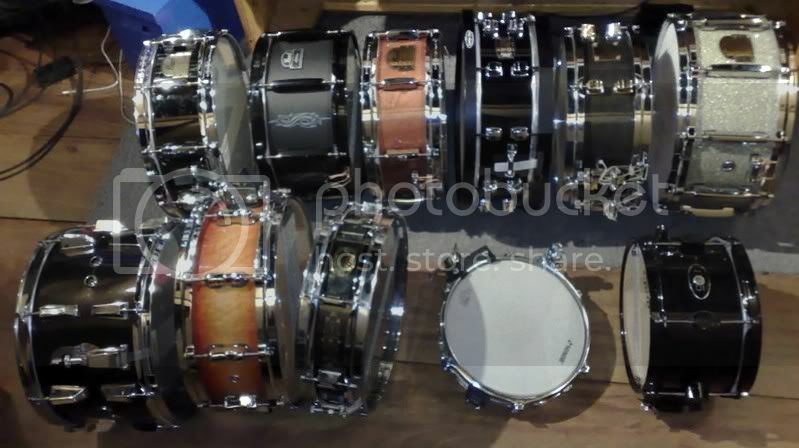 By the way, you also have a nice bunch of snares. Aprub! Great snares bro Dio! I see you very cautious with your items too! They are in great shape! And what a great collection of artist signatures!!! 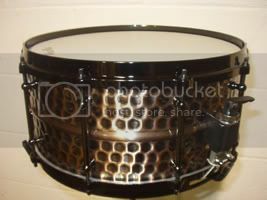 You can read my review of the 6"x10" PDP 805 snare here --- http://anthonydio.multiply.com/reviews/item/7 . Like what we say, it always depends on the music. If you're referring to the 6"x10" size, I think it has limited applications on rock and metal music (though pwede naman as long as it fits certain songs). For heavily-layered, amplified music, it's wise to use instruments which has the volume that can cut through thick walls of sound. One asset of my 805 side snare is its volume. On our bar gigs, I don't need to mic this little drum. It's naturally loud, and it cuts through the music. So I think its bigger-sized 13" and 14" siblings might have the same characteristics. Thanks bro! Like what I said, I take really good care of my equipment. I don't see maintenance as a chore. It's a labor of love. And yeah I'm lucky to have those great drummers sign my snare drum. It was all great timing and opportunity. laki ng iniba niyang gretsch sa jordison... maple vs steel, 14" vs 13". ang maple ang isa sa pinaka-warm na shell material... ang steel, isa sa pinaka-bright (kahit para sa bakal na snare, sobrang bright talaga ng steel). tapos ang laki ng iniba ng dynamics ng 14" na snare sa 13". hindi mo makukumpara talaga kung alin ang mas maganda e - masasabi mo lang kung alin ang mas swak sa gusto mong tunog. mabuti pang subukan mo na lang pareho yung mga drum. papayagan ka naman siguro kung mukha kang bibili talaga e para mas sigurado, sa jb megamall ka sumubok, mabait talaga sila dun. 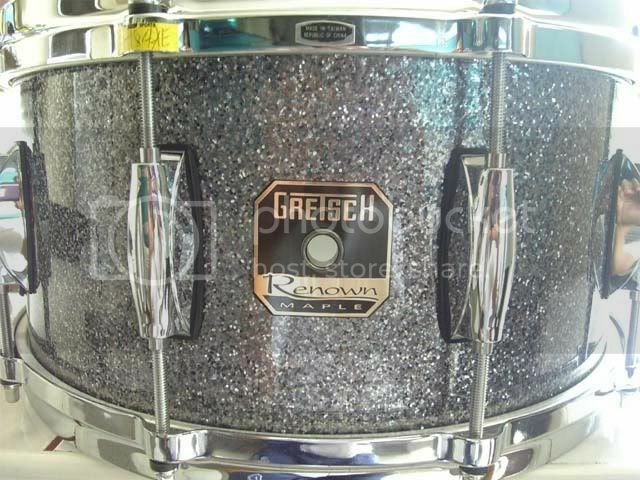 its still missing 3 tension rods..
mine is the all maple 6"x14"
sir greysky, magkano po biLi nyo dyan sa renown mapLe nyo? mababait naman tao sa JB Megamall ehehe! Bad Behavior has blocked 73323 access attempts in the last 7 days.